In April 2005, he famously compared private equity firms (and in particular international investors) to a scourge of Biblical proportion, as "swarms of locusts that fall on companies, stripping them bare before moving on." Most embarassingly, a list of twelve such "locusts" was leaked and published, including Goldman-Sachs, Deutsche Bank, KKR, Carlyle, etc. 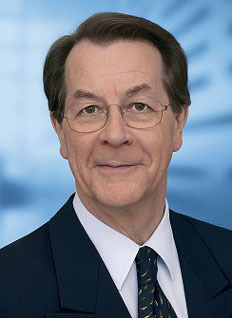 In 2004 he succeeded Gerhard Schroeder as Chairman of the SPD, and in 2005 was selected by Angela Merkel to be part of the coalition government, as Vice Chancellor and Minister of Labor.